In the wake of the success of Goldfinger, spy films were everywhere. Some were great, some awful, and some forgettable, but among the best were some well-remembered little films like the three British films to be reviewed here. WHERE THE SPIES ARE. MGM, 1966. David Niven, Fran�oise Dorl�ac, Nigel Davenport, John Le Messurier, Cyril Cussack, Eric Pohlmann. Screenplay by Wolf Mankowitz, Val Guest & James Leasor based on his novel Passport to Oblivion. Directed by Val Guest. 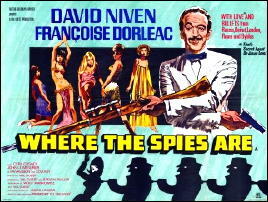 One of the brightest of the spy spoofs that appeared in the wake of the Bond craze that took off with the success of Goldfinger, this film was based on the first novel in the James Leasor’s Dr. Jason Love series. Leasor was a British thriller writer who also wrote historical fiction and popular history (Nemesis, The Sea Wolves, etc). In the film version, David Niven (who is a bit older than the character in the books, but otherwise perfect) is Dr. Love, a country GP who once did a bit of intelligence work. He’s approached for a simple mission that should be a holiday and enticed into it because he collects vintage Cords. That’s part of his cover as well. First some one blows his plane up, then his contact is killed. Love stumbles on a Soviet-backed assassination plot designed to set the Middle East on fire. He’s betrayed by the beautiful Dorl�ac, damn near killed, and ends up being kidnapped on a Soviet ‘peace mission’ flight and has to arrange a last minute Arctic escape. A terrific cast and the personable Niven make this one a pleasure. The script is smart, and for once funny. Add into the mix good location filming and a superior cast, and you have a film that works both as a spy film, a comedy, and a spoof. And it doesn’t hurt that Niven was not only a friend of Ian Fleming, but one of the real life models for James Bond (a role he only played in the disappointing spoof Casino Royale). This one is well worth catching. First class all the way. The Liquidator (1965) with Rod Taylor, Trevor Howard and Jill St. John. Another nugget regarding David Niven. I always loved him as an actor. Apparently Pres. Eisenhower made him a Legionnaire of the Order of Merit, the US’s highest honour to a foreigner (Lt. Colonel Niven) Joined the British Army’s Rifle Brigade regiment and served through Dunkirk, joining the commandos and later the secret Phantom Reconnaissance Regiment. He spent most of the time behind German lines with the latter outfit, a rough, tough, hit-and-run group harassing the enemy. Seems the suave, elegant actor must have had a pretty damned tough side to his nature.